2 kittens are better than 1 ............. Photo copyrighted. Please see our CAT SPAY & NEUTER section for FREE spay-neuter resources. Cat Inappropriate Elimination Getting kitty to use the litter box. Cat Stopped Using the Litter Box? If you prefer, contact Planned Pethood Taos for further cat & kitten fostering tips. Finding a New Home for a Pet This article is for re-homing your cat. Feline FIV FAQs answered by Best Friends Animal Society about the Feline Immunodeficiency Virus. Note: Our Planned Pethood Taos founder, a Ph.D. in biology, has read various scientific articles on FIV and based upon sound conclusions from well-designed experiments, in her scientific opinion, it is unlikely a mom cat would transfer FIV to her kittens in utero or via her milk. No Evidence of Vertical Transmission of Naturally Acquired Feline Immunodeficiency Virus Infection. Protection of Neonatal Kittens against Feline Immunodeficiency Virus Infection with Passive Maternal Antiviral Antibodies. Feline FeLV FAQs answered by Best Friends Animal Society about the Feline Leukemia Virus. Ringworm is a fungus related to athlete’s foot; it’s not actually a worm. If you want your cat to live a long & healthy life, please keep your cat inside. Building an outdoor enclosure so your cat can safely enjoy the outside. What is a cattery or catio? They are outdoor enclosures for cats. Cats love to spend time in the fresh air and watch birds, bugs, and other animals. A cattery/catio provides a way for a cat to enjoy the outdoors without danger of being attacked by another animal (such as a coyote), poisoned, struck by a car, lost or stolen. They can be made with a variety of materials and constructed in a range of shapes and sizes. They can be free-standing or attached to a house or garage, inexpensive or higher end, plain or fancy, bought or built. 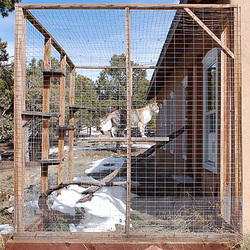 Example of a catio/cattery here in Taos. Unlike humans, whose fingernails grow from the skin layer, cats' claws actually grow from the bone. Declawing cuts off the cats' claw and the bone. Removing a human's healthy fingernails is considered a form of torture, so why would removing a cat's claw be considered a humane procedure rather than mutilation? Declawing can cause continued problems with the bone trying to regenerate, thus leading to repeated expensive corrective surgeries to try to deal with pain and lameness due embedded bone regrowth which causes infections. Declawing is banned in 8 cities in California, and the momentum is growing to ban it in other US states. Declawing is not performed in countries such as the United Kingdom, Switzerland, Sweden, Denmark, Israel, Ireland, Australia, France, Germany, Norway, Spain, Finland, Austria, India, Greece, Portugal, and many others. "Declawing is the amputation of each toe at the first joint. In humans, it would be equivalent to cutting off the tip of every finger at the first knuckle — very painful, indeed. People may not be aware that the surgery can cause more problems than it solves. Cats deprived of their front claws may develop an aversion to the litter box. Their paws remain sensitive from the surgery, so they avoid scratching in their litter and may begin eliminating around the house instead. Declawing leaves cats without one of their primary defense mechanisms, and impairs their balance and ability to climb. Many declawed cats suffer from joint stiffness. In certain cats, it may leave psychological scars that translate into behavioral problems." Because declawed cats have lost a primary defense mechanism, i.e., their claws, they can be more prone to biting when in a defensive situation, and should be kept indoors to protect them from predators. And it is not unusual for open-admission shelters to have to take a declawed cat from an owner who no longer wants to deal with the cat not using the litter box. If your declawed cat has stopped using the litterbox, try using a soft type of litter such as Swheat Scoop or a corn litter, and take the cat to the vet to rule out an internal paw infection or bladder infection. An easy, humane and more affordable alternative to declawing your cat is to purchase cat scratchers for your cat and/or trim the tips of your cat's nails. Cats love to scratch sisal rope scratchers and corrugated cardboard. If your cat is scratching the couch, buy a vertical scratcher; similarly, if your cat is scratching the carpet/rug, then buy a horizontal scratcher. Additional products such as Sticky Paws Furniture Strips for retraining kitty to not scratch furniture, and cat nail covers, such as Soft Paws, both available on Amazon.com, deter any damage from cat scratching. Amazon.com also carries cat nail trimmers and a wide variety of affordable cat scratchers. For more information on declawing visit The Paw Project.